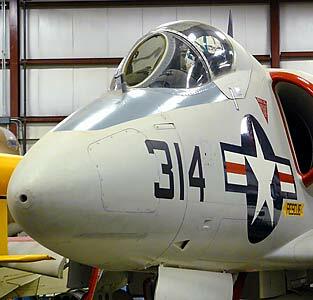 You can visit the New England Air Museum in Windsor Locks just outside of Hartford, CT. For directions and hours see the New England Air Museum's website. 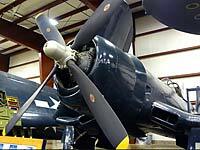 The New England Air Museum is one very large aviation museum! Of the aviation museums I've visited only Udvar Hazy in Washington and the USAF Museum in Dayton were larger. 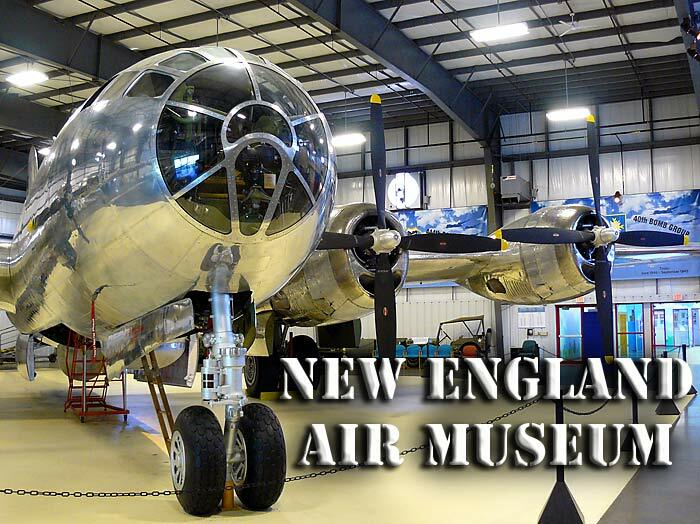 The NEAM consists of 3 hangars, the first with military aircraft, the second civilian, and the third nicely displays their outstanding WWII Boeing B-29 Superfortress restoration. It is especially nice in that the B-29 Superfortress shares the hangar with only one other aircraft and a few smaller exhibits along the walls so you can walk around the airplane and really see it well from most angles. It's hard to walk into that hangar without saying "Wow!". Several B-29 electric gun turrets, a radar unit, and a bullet resistant tail gunner window pane are also on display around the Superfortress. 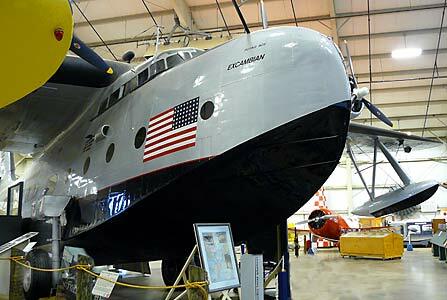 Their Sikorsky Flying boat is an outstanding restoration also and the last of the big commercial flying boats to have survived (it is BIG!). You can walk around it and get a good look at most of the aircraft and its details, and you'll get a good feel for the high level of workmanship the restoration crew have lavished on this VS-44A Excambian. But there are other planes and vehicles tucked around and underneath it so you won't get a full unobstructed view of the whole flying boat. The Sikorsky is even more impressive in person (my photos really don't do it justice). The flying boat sits on beaching gear, temporary wheels that allow the airplane to be taxied in and out of the water. They are removed once the flying boat enters the water. 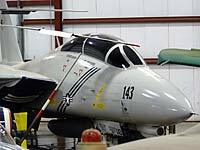 The top portion of each has a float that allows it to be more easily attached to the fuselage of the big Sikorsky. Another interesting aircraft in the civilian hangar is a reproduction of a Gee Bee R1 Racer, built by museum volunteers from original Gee Bee R1 blueprints. The quality of the restoration work these guys did is first class. There is also a Douglas DC-3 that was carrying paying passengers in the Caribbean until fairly recently. 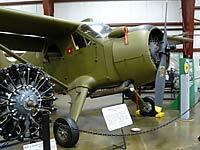 The military hangar houses the only surviving WWII North American B-25 Mitchell Bomber that mounts a 75mm cannon used for low level shipping attacks in the Pacific. 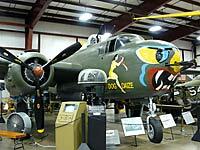 It must have been a nasty surprise for any enemy vessel on the receiving end of the B-25's firepower. The cannon has no recoil mechanism so it must have made quite a bang in the cabin when it was fired. It must have been hard on the aluminum airframe too. The Republic P-47 Thunderbolt, F4U-4 Corsair, and F-105 had stairs that were open to visitors to climb up and look into their cockpits. Some of the aircraft are open during museum "Open Cockpit Days" where you can actually climb in and sit in the pilot's seats. The A-10 Thunderbolt II is striking, even with its empty engine nacelles. A bare A-10 GAU-8/A 30mm Gatling Gun accompanies the A-10 and shows the drive gears, magazine, and ammo chute of the weapon out on a stand where you can get a good look at it. A good cross section of helicopters are also on display. 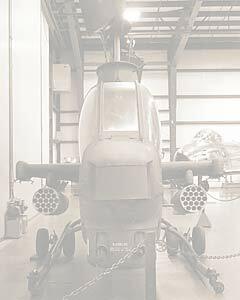 My personal favorite was their Bell UH-1 Huey which is the first I've seen with the M134 Electrically Driven Gatling Guns mounted with their ammo feed chutes in place. A Sikorsky Skycrane heavy lift helicopter sits outside the New England Air Museum. Another interesting aircraft on the grounds outside the museum is a MiG-15 Soviet Jet Fighter. I've always admired the clean fluid lines of that jet. Hopefully the outdoor aircraft will be brought indoors and restored at some time, especially that MiG-15 as it is their only enemy aircraft on display. The staff of the New England Air Museum were great, knowledgeable, and friendly, conducting tours and doing exhibit specific talks throughout the day. There was also a veteran scheduled to speak on his experiences as an aviator in WWII that morning, and I suspect they do this kind of thing regularly (the NEAM has a separate auditorium for speakers and movies during the day). If you are a genuine aviation buff, you'll need to allow most of the day to really see everything. 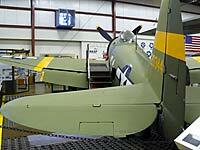 Each airplane has a spec and or story placard and there is a good deal to read about for each airplane and exhibit. Also there was at least one flight simulator that I recall and a fairly extensively stocked aviation research library. The Air museum has a good sized gift shop with a fair amount of NEAM related clothes and mugs along with other neat airplane related stuff. There is no food on site other than vending machine fare so plan on packing your lunch. There were also a couple of fast food places within a short drive of the New England Air Museum. Check with the museum staff. Be sure to visit the museum's website before you go. They are very kid-friendly and have regularly scheduled activities such as Lego building and modeling workshops that I wish I could have done myself when I was a kid. On their website you'll get an idea of what activities are being held for the kids as well as when the next regularly scheduled Open Cockpit Day is held. All the indoor exhibits were on one level and it is easily handicap accessible aside from the stairs allowing visitors to climb up to the cockpits of some of the aircraft. I think there may have been a step or two to get up to the dock/viewing platform alongside the Sikorsky Flying Boat to allow visitors to look inside. The outdoor exhibits are on grass, and it does slope a little bit on some areas and may be hard to transit in a wheelchair. I have to admit I'm kind of embarrassed that I've been driving through Hartford Connecticut several times a year since the late 80s and never knew this aviation museum was such a short detour from my route. I didn't even know it existed until recently. There is so much eye candy for any airplane enthusiast. I hope these pages get you motivated to pay these folks a visit. The staff are friendly and glad to see you and you won't be disappointed. Better yet, if you live in the area, volunteer. 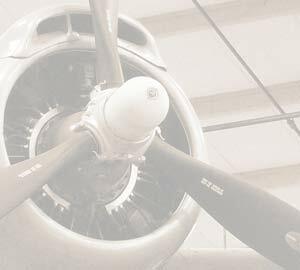 There's plenty to do and you'll be spending your time with some very historic airplanes and a great bunch of folks.